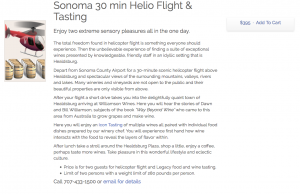 Williamson Wines was the top new find on our trip to Sonoma. After a few wines, co-founder Dawn Williamson joined us at the table for a lively conversation. 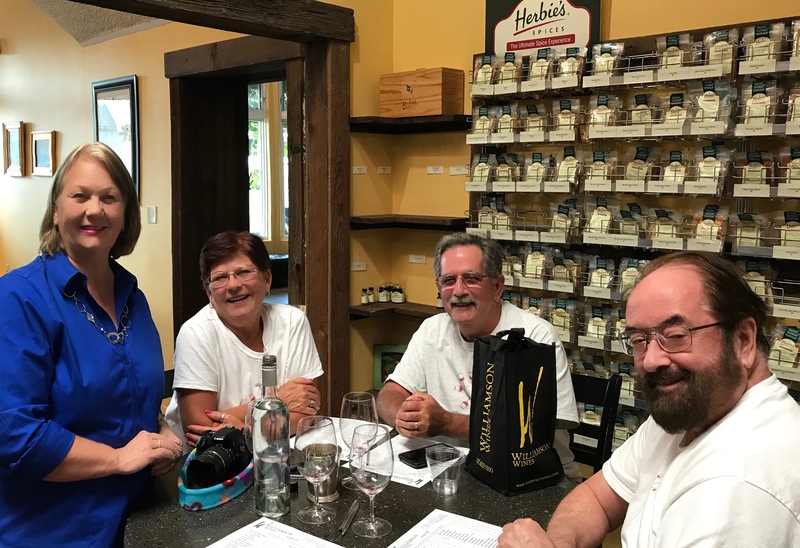 Along with her husband Bill they provide a unique experience at Williamson Wines. 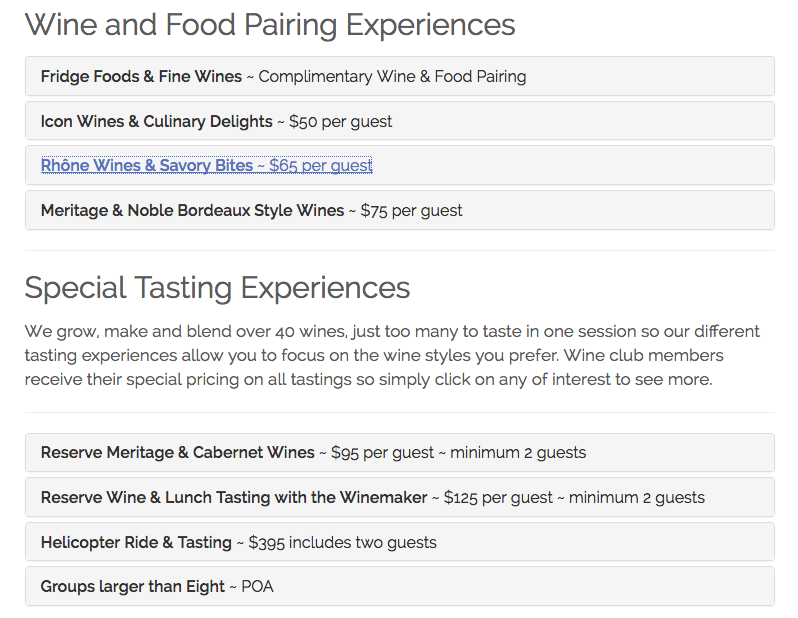 First, you can’t beat the price for the tasting: $0.00 for groups smaller than six people. 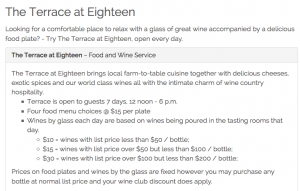 Second, they serve the wine tastes accompanied by food morsels so you can evaluate the wines in the context of an appropriate food. Dawn and Bill emigrated from Australia about 35 years ago. They’ve been making wine since 2002. 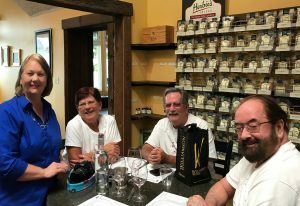 And their wine is great! 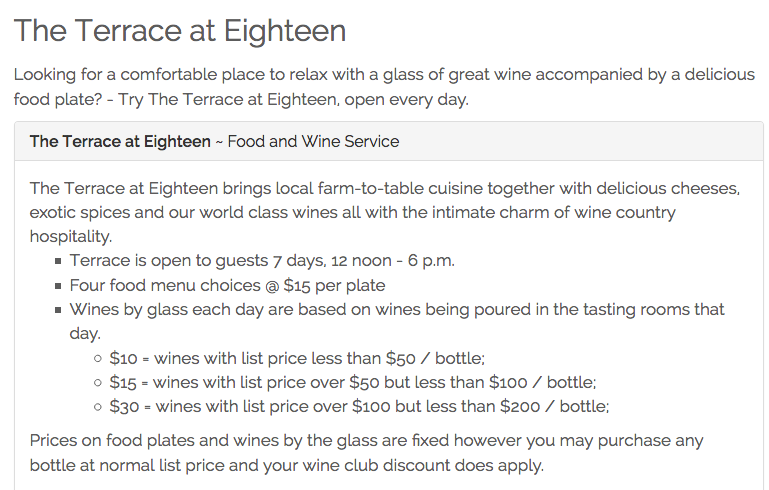 Or visit The Terrace at Eighteen (18 Matheson St. in Healdsburg). By making so many different wines, Williamson can produce small lots of each wine and still achieve some economies of scale. Production is 12,000 to 15,000 cases per year. That’s between 255 and 319 cases per wine on average. 2015 viognier “Frolic” Mendocino County ($34). Aromas of honeysuckle and orange blossom greet you. On the palate, light flavors of peach and apricot, with a nice finish of well balanced acidity. The food pairing was apple horseradish jam. 2014 grenache “Embrace” Dry Creek Valley ($47). Aromas of cotton candy supported by light hints of blood orange peel. Flavors of hint of apple and cranberry notes of light leather and soft tannins finish. The food pairing was Moroccan date sauce. 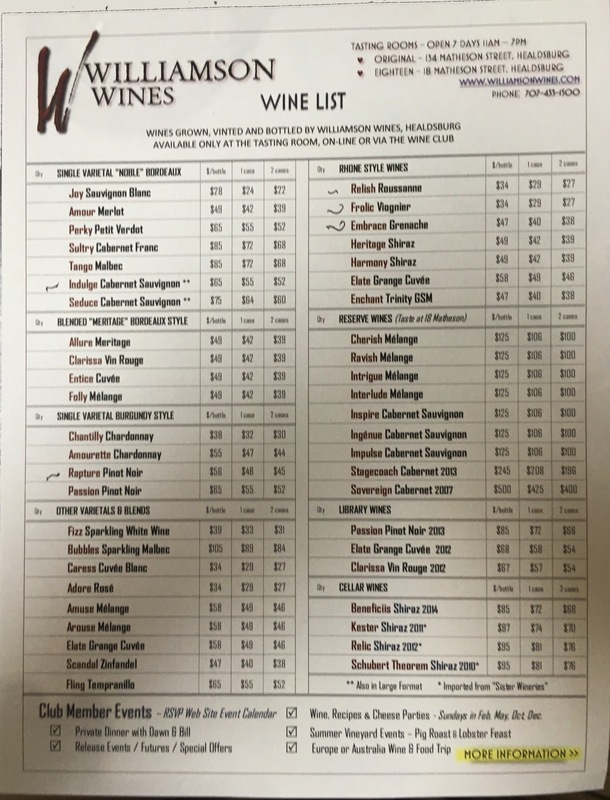 “Entice Cuvée” Bordeaux-style blend ($48). Blend of cabernet sauvignon, cabernet franc, merlot, malbec, petit verdot. Youthful aromas of coffee and blackberries greet you from the glass.. The cabernet sauvignon appears immediately on the palate, but softened by the merlot and malbec. The food pairing was jalapeño and sweet pepper jam. 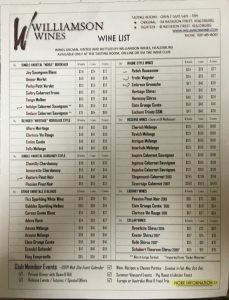 2012 cabernet sauvignon “Indulge” Dry Creek Valley ($65). Rich plum and blackberry with a hint of tobacco to the nose. White pepper and plum with hints of caramel, tobacco and black licorice on the palate with assertive tannins finish. Age this one for a year or two. The food pairing was blue cheese and honey. 2015 pinot noir “Rapture” Sonoma Coast ($56). Aromas of bing cherry and cranberry with hints of cinnamon and leather. The palate is earthy and big, with notes of brambleberry and clove lead to a long finish with silky tannins. The food pairing was truffle salt. People come to wine country and they think you’re going to have the big Viking stove, and you have to have all this stuff. We ship to New York, we ship to Washington, people have beautiful apartments, but they don’t have huge kitchens. We like recipes that you can cook in an apartment kitchen, that you can get on the table in a reasonable amount of time, and, as I tell young people, if you screw up it’s still going to be all right. … I have hundreds of cookbooks with all the pretty pictures. I enjoy them. You flip through them and see how pretty they are. You say, “That looks good,” then you look closely and it’s ¼ teaspoon of everything you’ve ever heard of. 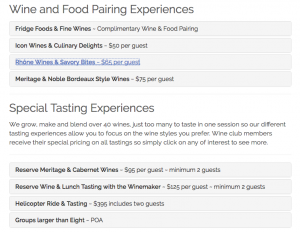 Together they have put together a memorable, unique wine-tasting experience. 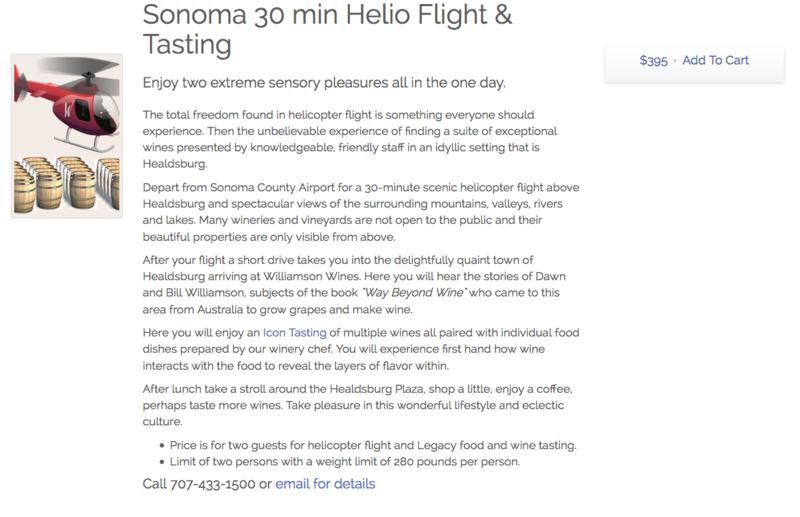 Assisted, of course, by their terrific wines. Not bad for immigrants from down under!